High school kids will never have a job again. Businesses aren’t going to pay $15 an hour to a kid who has never worked before. They have to be trained to show up on time and actually work the entire time they are clocked in for. They don’t produce a value of $15 per hour. Shoppers will be checking themselves out at many more stores since profit margins can’t pay employees $15 an hour without massively increasing the price of products sold. People already making $15 an hour or more will need their wages increased to stay ahead of inflation. It will be rampant. Hours will be cut for existing full-time employees so they won’t qualify for benefits like health insurance. That savings will be used to cover the rising costs of labor. How much will the cost of a pizza delivered to your house be? Still tipping a driver making $15 an hour? Businesses that don’t need to be in Illinois will move. It’s cheaper to relocate than be told how they must run their business. Government interference in free markets has always been disastrous for workers. All of the above has happened in places that have increased the minimum wage for people with no skills deserving a higher wage. With unemployment low, wages have been rising. 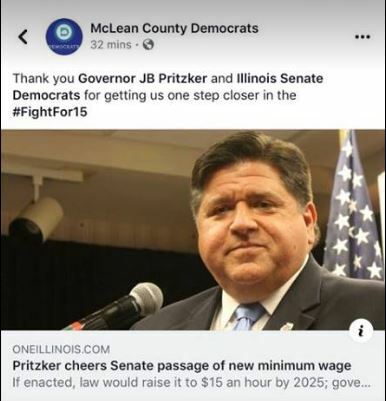 (Maybe not in socialist Illinois however) The local Democrat Party supports telling employers what to do. Why aren’t they asking for $50 an hour? Likely because they know the effects that would have on the economy. They also know the effects $15 per hour will have on the economy. They don’t care. Pretending to help people gets votes, the catastrophic results will be deflected and blamed on greedy business owners. Pay rates are based on the value of the services performed. If people want higher pay – increase your value. It’s not that difficult. Event from the past were once in the future. This is why progressives never want to look back at history. They would see today’s disasters were promoted by them. Socialists always believe Utopia is only a couple of programs away. This $15 minimum wage will not bring them closer to utopia, unless the real goal is to create more government dependents. Posted in - - - Please Contribute - - -, BloNo, Bloomington, elections, Local, Normal, Progressives, State.Tagged $15 minimum wage, history, McLean County Democrats, Socialists. Trouble already brewing in left-wing paradise???? Dietz is crying to the Slantagraph that the $15 minimum wage will cost ISU (by which he means taxpayers)… “Illinois State University President Larry Dietz said Thursday that increasing the minimum wage from $8.25 to $9.25 an hour — as proposed in the first phase — ‘would cost us about $600,000.’ *** “The cost would be $7.5 million once the concept is fully implemented,” he said, referring to the $15 rate that would take effect in 2025.” Of course, Dietz said the solution was for the (broke) State of Illinois to send more money to the university to support this “unfunded mandate”. He’s right about the unfunded mandate part but hopelessly lost on the proper solution or course of action. Wonder if the students will harass him for daring to challenge the fight for 15. JB the Prickster and Mike Madigan will gleefully continue in destroying Illinois. When you think of the Pritzker’s, think of the Kennedy’s. Anything done during this administration is to broaden the base so JB can run for President someday. Like the Kennedy’s, they know that ultimate political power ensures that the family’s fortune is protected and built-on ad nauseum. JB didn’t major in political science and get his law degree for nothing. Just like Camelot, there is a purpose and reason for everything. Plenty to read about this family history if you are willing to invest the time. How many unions have set wage increases based on rise in minimum wage increase or automatic contract renegotiations because of minimum wage increases? The cost of products will rise and negatively effect the same people the increase is said to help. Look at the SIMPLE economics. IF a person making $8.25 an hour NOW is boosted to $15. They’re MAKING more an hour, this HAS to be offset by business ACROSS THE BOARD charging MORE for THEIR goods and services! Therefore EVERYTHING will rise in price/cost. So your $15 will actually have LESS buying power then it did before when you were making $8.25, so you just would up creating inflation AND making MORE people below the poverty level. THAT’S what the DEMOCRATS like! Then they’ll blame someone else for YOUR lessened buying power. Probably the Republicans or the Chinese (Who WILL have YOUR job)..
There’s another article in the Slantagraph with local business owners expressing concerns, including those in Tari’s Downtown Utopia. Wonder if the Downtown cabal and Uptown businesses will continue to pushback on our dear leaders. This could get fun! Hmmm, from $8.25 to $15.00, what is that an increasee of about 81%? Gosh, do ya think those progressive redneck union boys are gonna gripe about paying $5-$6 for a bottle of Budweiser? People should be paid what they are worth–determined by the free market. There was a study several years ago where 60% of teenage workers self reported STEALING from their employers at least one time. 60%! And we’re supposed to give them 15 bucks and hour. Give me a break! My business will close if this passes. No joke. The $15 wage has been tried in Seattle and NYC and both have failed miserably. Yes, they got their increase in wages but they also got increases in food and services. They also got their hours cut their tips taken away from them and they have seen their businesses shut their doors . Leave it to the Liberal idiots in Springfield to further take Illinois down the toilet of life. Be prepared to pay more for your food, more for your booze , more for your everything. Businesses WILL pass that wage increase on to their customers one way or another. The only ones who will NOT suffer for this idiocy is the lawmakers and Gov Prickster, they dont worry about such trifle things. And if you think $15 wage is bad news just wait till the gas tax and the MPH tax gets passed! Will social security get an 81% raise by 2025, to keep up? Not! This increase is absolutely insane! ole’ Jelly Belly Prickster, born into absolute wealth has no clue about the real world. No clue! Well, maybe during this one term the people of Illinios will never vote for a democrat again. JB along with Madigan are going to really make quite the impression. Wow! ” the people of Illinios will never vote for a democrat again” Yeah, they will. The Democrats raised the State income tax 60% and were rewarded with MORE seats in the General Assembly. Besides, with illegal (and illegals) voting, and the demographic collapse of American society, fraud assures that a Republican probably cannot be elected to Statewide office ever again. The future is very, very dark. And that GIANT SUCKING SOUND you hear is thousands more job creating people fleeing the Democrat hell that is Illinois. Can anyone say MASSIVE INFLATION? Previous Post Bloomington’s Business Registration is here!